Food Costs > How Much Does a Donut Cost? How Much Does a Donut Cost? Donuts, sometimes spelled doughnuts, are a popular sweet snack that are sold in various bakeries/stores in many countries. In the United States and Canada, doughnuts are a popular choice for those who would like to have something sweet for breakfast. A donut is a type of dough confectionery that’s deep-fried and formed in shapes, normally in rings, and sometimes with fillings. Donut stores have also learned to offer a different variation of donuts through the years like donuts with decorative toppings and flavorings. The two most popular types are the circular type with the hole in the middle and the filled doughnut. A single donut, regardless of where you purchase one, can be anywhere in the $0.89 to $1.50 range. Your basic glazed donuts will often be less than $1, while a specialty donut can be closer to $2 each. A dozen Dunkin Donuts costs about $7.49, whereas a dozen donuts at Krispy Kreme can cost $6.99. Tim Horton’s, another popular donut chain, sells a dozen for about $5.49. Relaxorium.com compared Krispy Kreme Donuts against Winchell’s, and they quoted the price of a dozen donuts at Krispy Kreme at $6.75; at Winchell’s, you get 14 donuts for $5.99. Krispy Kreme donuts came out to be 85 cents apiece if purchased singly, whereas the Winchell’s are 70 cents each. On average, plan on spending anywhere from $0.50 to $0.99 for a single donut. The more you purchase at a time, the more you will be able to save. Most donuts belong to one of two categories: either a yeast donut or cake donut. A yeast donut is made from a dough that use yeast to make it ride, much like bread. A cake donut is one that is made from a cake-like batter. Yeast donuts are lighter and fluffier than cake donuts, which are more dense and moist. Aside from the ring-shaped donut, other shapes can include flat spheres, balls, which are commonly referred to as donut holes, and twists. A dozen donuts usually come packaged in a box of flavors of your choice. 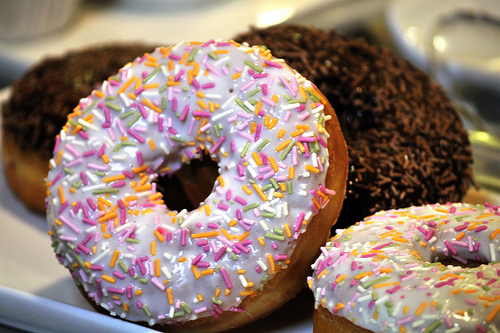 Donuts are generally deep fried in flour dough and can be found in grocery stores, bakeries, and popular franchises. Dunkin Donuts, for instance, is known as one of the most popular donut chains in the country. Established in 1950, they are the second oldest in existence next to Krispy Kreme. They claim to churn fresh donuts daily and have a wide array of attractive and delicious flavors to choose from. Injected donuts are often filled with fruit preserves, custard, or cream. Specialty donuts can often be ordered from various companies, such as Krispy Kreme as your local bakeries. These type of customized donuts will be considered an additional expense. There is no minimum order for delivery but you will have to pay for corresponding delivery charges unless you purchase a minimum of 3 dozen Krispy Kreme donuts. Orders of less than 3 dozens will incur an add-on cost of $12. Many bakeries can deliver, and regardless of the cost, some may charge a flat rate or charge by the mile. The most basic donut is round in shape with a hole in the middle. These can be glazed or covered with frosting, powdered sugar, and decorations. Donuts that are considered cider donuts are usually plain or covered with a cinnamon and sugar combination. A cruller is a long rectangular-shaped donut that can also be glazed or frosted in the same way that a round donut can be. most crullers are made from cake batter, but the French cruller is one that is made from yeast. A round donut with no hole in the middle is usually filled with something such as cremes or fruit fillings. Other types of donuts include desserts such as cinnamon rolls and apple fritters. While they are made from the basic ingredients which a donut is made from, they usually taste and feel much different than a donut does. If you want a donut that you can just pop in your mouth, a donut hole is a perfect match. Donut holes are made to resemble the piece of the round donut that has been cut out of the middle. These are essentially bite-sized donuts that can be flavored the same way as a round donut. A donut hole can be made from yellow, white, or chocolate cake batter. When purchasing a dozen donuts, most bakeries have more than 30 flavors from which you can choose. Many bakeries offer perks for frequent purchases through the accumulation of points earned with every purchase. Take advantage of these if you are a returning customer. Buying donuts as a single will always cost you more than purchasing in dozens. Krispy Kreme offers loyal customers points that they earn every time an order is placed online. These points, when there is enough, can be used to redeem the original glazed donuts flavor for free. Many large companies offer coupons online through Facebook and their website. Be sure to search for coupons before heading to a local shop.